Once every ten years, bishops from across the Anglican communion (that’s the Episcopalians here in the US) meet at Lambeth palace with the Archbishop of Canterbury. This time around things have radically shifted, since the 2003 elevation of Gene Robinson to bishop of New Hampshire. Robinson is openly gay, and in a decades-long relationship. This has sparked the ire of conservatives from around the world, including here in the US, and especially in the growing Anglican churches of Africa. In many of these countries, homosexuality is punishable by death or imprisonment. My vote for the creepiest clergy member in the world would have to go to Archbishop Peter Akinola of Nigeria (read a summary of an Atlantic Monthly report here). The guy is pretty much conflating Islamophobia with homophobia, and shipping it around the world, and is likely complicit in the massacre of Muslims by Christians in Nigeria. The NY Times writes about Gene Robinson’s exploits in the UK, neatly framing the attitudes of conservative Anglicans — Robinson wasn’t invited to Lambeth so that both sides can show up and debate freely. The conservatives didn’t go anyway. They set up their own conference instead. 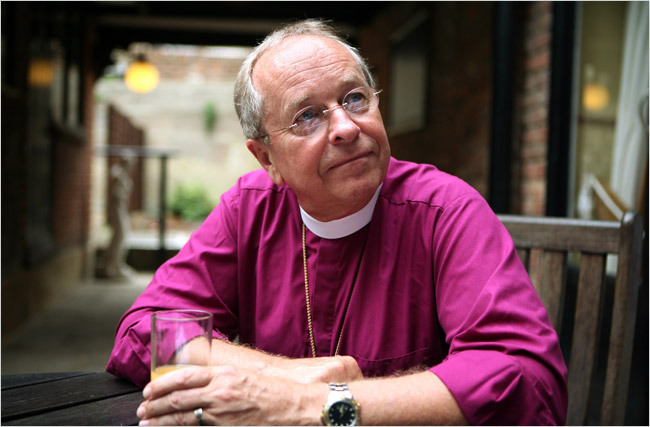 CANTERBURY, England — For a man at the heart of a bitter dispute that threatens to sunder the Anglican communion, Bishop Gene Robinson seems more relaxed than almost any of the 650 bishops and archbishops gathered for the Lambeth Conference, the once-a-decade assembly that brings together the leaders of an estimated 80 million Anglicans worldwide. The easy demeanor and constant smile of this openly gay 61-year-old Episcopalian bishop of New Hampshire, when we meet at the Falstaff Hotel just down the street from Canterbury Cathedral, are all the more remarkable for the fact that he is the only man among the many wearing the Anglican bishop’s purple on Canterbury’s streets these past two weeks who wasn’t invited to the conference. Indeed, since the conference first met in 1867, he was the only Anglican bishop anywhere, except those disgraced for disputed legitimacy, malfeasance or criminality, to be told — in his case, by the Most Rev. Rowan Williams, the archbishop of Canterbury — that there was no seat for him at the Lambeth table. Here’s a handy guide to what’s going on in this massive, worldwide church now that it has grown to include a massive array of cultures.